Most American soccer fans know the name Peter Wilt. He has worked a soccer executive for the past 30 years though he started out in sports by working for the Milwaukee Brewers baseball team and Milwaukee Admirals hockey team. In 1998, he helped launch an MLS expansion team, the Chicago Fire, that won the MLS Cup and U.S. Open Cup double in its first season. He also started up the Chicago Red Stars women’s team and the Indy Eleven that played its first NASL season in 2014. Last year he began working to find teams interested in participating in the startup of the National Independent Soccer Association, which would be separate from the lower-division United Soccer League (USL) that is linked closely to MLS. 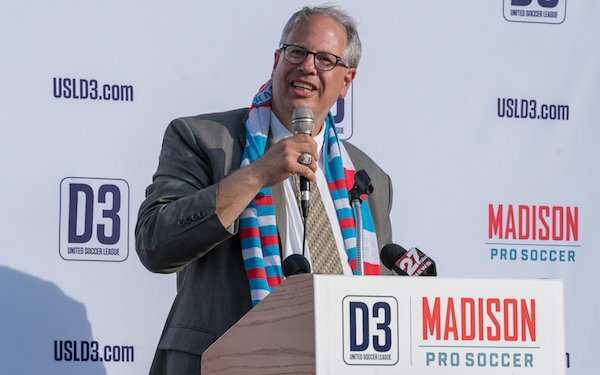 He left NISA last week to take on the task of launching a USL Division 3 team in Madison, Wis., that will start play in 2019. SOCCER AMERICA: The Madison project is the sixth soccer team you have helped launch. You’re a Wisconsin native and resident, but that other factors influenced your commitment? PETER WILT: The opportunity is a very good one because of the demographics and the timing. It’s a very young market, a large percentage of young adults, millennials, as well as a lot of college graduates who stay in town. The youth soccer base is actually really good and they have a history of soccer there in the Madison 56ers, going back to 1956 hence the name, and Jim Launder and his championship team in 1995. So there’s an interest in it. And the venue is in a great location and is very good and going to be better for soccer viewing. It’s located about a mile east of the capital and the neighborhood has a high concentration of young adults that are passionate about soccer. It’s booming. Apartment buildings are going up, there’s a lot of retail [shops], bars and restaurants popping up. SA: You place the importance of the right venue very high on the checklist. Breese Stevens Field has been the home of the 56ers since they started up in 2005. WILT: The venue itself is historic and intimate and is going to get much better with the investment from the city. Big Top Events, owners of the Mallards, have done a marvelous job in town for years and have upgraded the facility by adding some hospitality components. We’ll be putting in a supporters’ section to create a great atmosphere for soccer. I mentioned timing. Madison has never had professional soccer before. Wisconsin hasn’t had professional outdoor soccer for 15 years, since the Milwaukee Wave/United ill-fated outdoor attempt stopped. There was the Milwaukee Rampage before them. So I think there’s a certain thirst for professional outdoor soccer. SA: Cities all over the country not traditionally known for soccer interest are coming to games and supporting teams in significant numbers. These people in places like Chattanooga and Charleston as well as bigger cities like Cincinnati and Indianapolis and Louisville are pro-soccer rather than the hard-core skeptics the sport is so familiar with. WILT: Right. It’s gone beyond the generation who grew up playing the sport. This is the generation that has grown up watching the sport and playing the FIFA video games. I think that’s really manifested itself in the last decade or so in markets as disparate as Detroit and Chattanooga, NPSL markets that have done really well with amateur soccer with that audience being a strong source of support. The larger-market and higher-division examples of Seattle and Atlanta and Kansas City are just as true. To a certain extent, that is what’s being mirrored in markets like Madison and Cincinnati and Indianapolis and Sacramento. Madison is a smaller market, just like Chattanooga is, but smaller markets are proving it’s not just about quantity of people. It’s also about the qualitative nature of the demographic. SA: Chattanooga has a stadium, Finley Field, already familiar to fans as the home of UT-Chattanooga football. The U.S. men’s and women’s teams have played there. During your search for teams to play in NISA did the venue problem prove insurmountable? WILT: 100 percent yes. That’s a key. I looked at dozens of markets around the country for NISA, and the venue oftentimes was the stumbling block. In Madison, like Chattanooga, there is an existing venue that with a modicum of upgrades would be well-suited for soccer. That’s not always the case. SA: What else has plagued the efforts of you and others to get NISA up and running? WILT: Oh God, Ridge, we could write a book about this. I probably will at some point. Certainly venue has been one of the stumbling blocks, but not the only one. With NISA, I think the vision was pretty much shared and is shared with these different groups. The challenge is the pathway to that vision or to go through that vision is different for three or four different groups. You’ve got Rocco’s [Cosmos owner Rocco Commisso] group, [Jacksonville Armada owner] Robert Palmer’s group, the NISA group, and Riccardo’s [Riccardo Silva of Miami FC] group. Ultimately, I think the four groups will get on the same page and hopefully there will be new leadership that can fill the void of my leaving and help them get there. I think it was a byproduct what created the NASL in the first place -- the second-division version of it -- and that was a desire for independence. These are owners who did not want to be constrained by a central office. They wanted the ability to operate independently. There are certainly strengths in that and legitimate, valid reasons to go down that path, but at the same time it led to the individual owners having their own individual priorities. It was very difficult for them to work together. Structurally, it’s a weak league office. It’s not centrally held together like MLS or USL. SA: What are the key factors in the startup of a soccer team? WILT: It’s two things and I’ve tried to replicate this everywhere I’ve done. It’s hiring good people and creating emotional connections with the community. It’s those two things. Hiring good people sounds simple. It’s about getting talented, hard-working people with good character communicating well. I’m fortunate that I have the ability to identify those people and then hopefully motivate and manage them. The second part, creating emotional connections, is what all sports are about but more so soccer. It’s tribal, right? It’s about building those bonds, those bridges, so that the community – not just the fans – and social organizations and charitable organizations and corporate partners and everyone feels that this soccer team is representing my community. And the community has a sense of pride so that the connection becomes more relevant, more important. Cities where there’s a large homegrown population – normally in the East Coast and the Midwest – that sense of pride and sense of community is pretty deep and can be tapped into by sports teams that approach things from the bottom up as opposed to the top down. In some of the Sun Belt cities and other markets, where there’s a more transient population, it’s a little harder because there isn’t that sense of community. Madison is one of those cities that does have great pride in itself and that gives me confidence that we’ll be able to tap into that and the soccer team will be a representative of the community-at-large. The city will take pride in the soccer team as it does in the city itself. SA: One of the big sports stories this year is the amazing success of the Golden Knights NHL team in Las Vegas. The soccer team, the Lights, is also doing well and the NFL will be there pretty soon. The population in that city has grown and changed to one of long-term residents, not people on their way to somewhere else. WILT: Yes. I’m going to use a big word here: I bifurcate the Sun Belt cities into two groups: one is transient and the other is transition, I guess. Atlanta and Las Vegas are becoming more transition where people are moving there, so they’re new residents, but they’re staying there and growing their families and their families are staying there. They are getting the second generation and in the case of Atlanta the third generation of people who are native to Atlanta. Miami may be the extreme example of a transient city. Miami is not a good sports city in any sport, even the NFL. There are cities like that where people just don’t consider it their home. They come from somewhere else and their loyalties are elsewhere. But in places like Cleveland and Buffalo, where maybe 70 percent of the population comes from Cleveland and Buffalo, they take pride in their community and they’ll support their sports teams more than they do in other cities. SA: Do you hold out hopes for an outdoor team in Milwaukee? WILT: Milwaukee has the right kind of mix. Milwaukee is one of the largest cities in the country without professional outdoor soccer and is also one of the best cities without pro soccer in terms of soccer heritage and other elements like a large homegrown percentage. Part of our vision with Big Top Soccer, the holding company for the soccer team, is to grow the sport, from a spectator standpoint, around the state, not just in Madison. Milwaukee is certainly on the radar for that. SA: The lower divisions are changing drastically. The NASL is on hiatus and USL is steaming along on its plan for Division 2 and Division 3 operations starting next year. Next year will look very different than 2017 but how much more change you do anticipate? WILT: It’s definitely an evolution. I think it will take two or three years for it to be fully populated. That will create some challenges from a travel standpoint and a rivalry standpoint but I’m confident the map will fill out in USL D3 in relatively short order. The value proposition’s pretty good. SA: And in regard to Division 2? WILT: They’re in pretty good shape. As far as I know, they’re meeting all the Professional League Standards (PLS). The USL central office, the infrastructure they’re creating is quite impressive in terms of providing resources these Division 2 teams can utilize. They’re not all Cincinnati and Sacramento and Indianapolis but they have a good base of teams and they need to continue, like everybody does, to build at the local level with the resources that USL provides. That means none of these teams should not have any excuse to not to do the work to succeed. SA: Right now, Division 2 is a mishmash of MLS reserve teams, teams with MLS affiliations, and independent operations. As an example of an independent team, what will suit your needs as well as those of the USL and the other teams in it? WILT: There are two general considerations. One is the quality of play, and the second is the cost of operations. In general, MLS teams view their reserve teams as developmental and don’t see it necessarily as a business opportunity. So minimizing expenses would be higher priority for them, which plays well for those teams to play in D3. Obviously, the competition needs to be at a level so the players are developing both in games as well as training. I think that will sort itself out over time but certainly we would like – as far as Madison is concerned -- to see the competition on the field of sufficient quality to challenge those MLS reserve teams, so they can improve and develop. And I don’t know if we’re going to be totally independent. We may end up forming a relationship where we get some players from an MLS team. That’s to be determined. There are pluses and minuses with each of those three scenarios. There’s total control, zero control, and between the two. SA: Many MLS teams have poured money into their training facilities to house and service their teams but it can be hard to justify extensive travel and other costs for a reserve squad. WILT: It’s travel, it’s stadium, locker rooms, press boxes, and all those standards required at the D2 level that aren’t required at the D3 level and are a better fit for these MLS reserve teams. SA: USL has been charging a hefty expansion fee of $5 million for teams to join. Will that continue, or will existing teams that did pay up be compensated somehow if newcomers are not required to do so? WILT: I don’t know. That’s a good question for those teams and for US, not for us. USL has its model and in a supply-and-demand situation, and that’s dictating what those fees are. SA: It’s been 20 years since the Fire’s remarkable expansion season that captured the U.S. Open Cup as well as the MLS Cup. The team did well off the field as well. I imagine when you start building out your staff, you’ll have a much larger pool of enticing candidates to choose from. WILT: Absolutely. There are two big differences between the current situation and that one, maybe three. One is that the pool of talent that has soccer knowledge and interest as well as business skill sets is much, much, much deeper now than it was 20 years ago. Back then, I couldn’t do it. I couldn’t staff out the Chicago Fire purely with people that had knowledge about soccer and passion and interest. I tried to do it as much as I could. We brought in some baseball folks, some non-sports people and made do. Now the pool is much deeper, so that’s the good news. The fact that we’re third division and have lower budgets than an MLS team is challenging for getting the experience. But there are talented, entry-level candidates that just need to learn more on the job. There are a lot of candidates, too, that have internship experience or they’ve had their entry-level experience somewhere and maybe they’re ready for a manager position. So they’re out there and there’s more interest in working in soccer than there was 20 years ago so that offsets it. In our case in Madison, we also have the infrastructure in place from the baseball team [Madison Mallards, a summer team of collegiate players] and their staff, which gives us a backroom staff that may not have soccer acumen but administratively they’re top notch. The customer service, the marketing, everything. These guys have got it going. They’re one of the best groups I’ve ever seen. They do it well. There’s no shortage. I’m not saying they’re coming out of the woodwork but my e-mail and have phone have been very busy the past week with people who are interested in working with us to build the team. But we do need to develop a soccer culture and that’s one of our missions with this. SA: Since Madison is team number six can you run down the other five? WILT: Three of the five that I started are still going. Chicago Fire, Chicago Red Stars and Indy Eleven. The Chicago Riot was one of those one-year wonders that the MISL wanted me to put together. It was owned by the league itself and we made it through the year [2010-11], which was a success. Our financial bottom line was better than any other team in the league because they didn’t give us any money so you can’t lose that money if they don’t give it to you. The other team was the Minnesota Thunder, which depending on how you draw the line is still in existence. It went from Minnesota Thunder to Minnesota Stars to Minnesota United to Minnesota United FC in MLS. The new stadium is going to be great and Amos Magee is there, so it’s great that people I worked with in my Thunder days are still involved in the organization. SA: Thunder is a good nickname. It’s too bad they couldn’t keep that. WILT: Yeah, I liked it, too. The other two teams that I ran but did not start were the Milwaukee Wave and Chicago Power, two indoor teams. The Wave, of course, is the oldest continuously operating pro soccer team [founded in 1984] in the United States of America. SA: Can you go back a little bit about Indy Eleven? Wasn’t that a case of people saying initially ‘Why Indianapolis?’ and now it looks like a brilliant move? WILT: When we started in 2012, people didn’t really think that would be a good soccer market because there was already too many professional sports in town. Maybe the interest in soccer wasn’t that strong. They didn’t recognize the vitality of that market. It’s younger than people think and it’s full of people looking to move the city forward. It’s a surprisingly progressive city in a very conservative state. We managed to make it work by building a brand and becoming a manifestation of the city itself. During the launch phase we heard people saying, ‘Indy Eleven is everywhere. I see your logo, you’re scarves, your staff, your fans.’ We only had a staff about a dozen people, but what we did is deputize hundreds, if not thousands, of people by bringing them into the fold and making them advocates of the team, at a minimum, and through the Brickyard Battalion, a lot of them became evangelists. You almost got the feeling it was the same spirit that the Green Bay Packers fans had in Wisconsin, that they were very proud that the soccer team was representing them. We ended up selling 7,000 season tickets for the first season and cutting off sales five months before our first game because we had 11,000 seats and wanted to have enough for group tickets and single tickets. We were the first American soccer team to sell out every home game our inaugural season. We did it with one ticket-sales director and one full-time ticket sales person. It really came about because of the marketing and community relations. The byproduct of that was people ordering tickets. I think that’s more sustainable then a traditional sales effort, which can be successful if you’re very good at it. Through the marketing and the community relations, you make people feel part of the process instead of having to re-sell them a ticket over and over and over again. They’re selling themselves and they’ll re-order as opposed to being re-sold. There’s obviously a place for both directions but the marketing and public relations should not be overlooked. SA: I questioned the nickname, as did many people. Shows what I know. WILT: When we first put the name out on the morning of April 25, 2013, the public reaction was negative by about 80-20. Then we put out an infographic that explained the back story and the connection to the 11th Infantry Regiment and Lew Wallace and Ben-Hur all of this stuff, and by the afternoon the social-media reaction seemed to flip to 80-20 supporting it and the 20 percent that was opposing it was, for the most part, out of state, soccer fans from around the country. They saw only the number of players and thought it was over-the-top obvious. But the locals gravitated to it and liked it. SA: What about a nickname for your new team? WILT: The Madison process is underway and it’s going to be interesting. We have maybe 300 submissions so far and more than 150 season tickets so it’s generating a pretty good buzz. We’re going to have like qualifying rounds. We’ll put maybe 10 teams out at a time and pick two of them after people vote on them. When we get eight we’ll do brackets. The voting really does help us. If we really like a name but no one else likes it we’ll probably shy away from it. And vice versa. If there’s a name where the community says, ‘Yes, this is what we want,’ and it didn’t rank as high with us, it will move up higher. SA: So group play and then knockout. WILT: Yeah, exactly. And the timeline is looking like we may be able to match the World Cup and have the final name at the same time. SA: In MLS proliferation of teams named United has rankled some people. What is your stance regarding these usages for American soccer teams? WILT: The United issue in particular bugs me if it’s not truly uniting multiple teams. Because that’s what it is, clubs coming together, okay, it’s United. The other thing, where you’re usurping the other European names, whether it’s Real, Sporting, and all that I think is a bit over the top and not necessary. Sporting I would have felt better about if it was truly a sporting club and they had basketball and football and cycling and whatever. I tried to get some other sports teams for Indianapolis but they wanted no part of having a darts team. I was working in Milwaukee to get a team six or seven years ago and our working name was Brew City Athletic Club and we had plans to truly be an athletic club with a dozen amateur teams or semipro teams that would share the same name. In that case it’s fine, it’s commendable and kind of neat. My bigger struggle is FC versus SC. I used to be real hard-core SC and had no patience for the FC folks. But I’m starting to loosen up a little bit on that. Shame on me, I guess. I don’t feel strongly one way or the other. I harbor no ill will toward the FC folks. SA: Well, since the winning entry might have FC in it you have to say that. WILT: Exactly, exactly. We did have a submission of AFC Madison -- for Association Football Club -- because that’s truly what it is. I like that one. 2 comments about "Peter Wilt talks about starting up another soccer team in Madison, independent landscape and his days in Chicago and Indianapolis". s fatschel, May 31, 2018 at 2:48 p.m.
Good to see D3 coming for US players. Non MLS USL clubs don't have homegrown players and have high turnover each year, so tough to connect with community in that way. Often results in low attendance, since soccer level is not the best. humble 1, June 1, 2018 at 9:48 a.m.
Nice interview. Madison is close to my heart. Breese will be a great venue. I like the use of the term 'community' with soccer, much more than 'elite'. Don't know Mr. Wilt but what a wealth of experience he brings! I think he has the correct approach for Madison and the club will be a success. I really like the new vision to link existing clubs with roots and newly forming leagues. Wishing this project all the best!